Newcomer Family Obituaries - Duvon J Mathews - Newcomer Cremations, Funerals & Receptions. Duvon Julius Mathews mommas baby boy, born on June 7, 2001 to mother Kimberly Maynard and dad Justin Mathews. He went home to heaven on November 28, 2018 at 12:06am. He is being greeted by his grandfather Duvon Mathews, Uncle Danny L Maynard and great-grandparents. He leaves here his mother Kimberly Maynard-Jordan (Felix), dad Justin Mathews(Tasha), two oldest sisters Taylor and Desiree, older brother Justin aka Bubbie, sisters Brooklyn Breana and Amir, brothers Xavier and Emmanuel, step-sister Destany Knight, grandfather Danny Maynard, grandmother Barbara Gay (Robert), grandmother Janice Sue Mathews-Ward, uncle Jason Mathews, neices Danielle, Serenity, nephews baby Tae’lor, Chase, Jayden, aunt Kisha Maynard and cousin Lane, special aunt and uncle Angie and Brian Dotson, cousins Hunter and Dylan, special aunts Tammica Jordan and Tish Dominguez, special aunts Ella Dean and Chrissy Dotson, special cousin James Davis aka Lil Jazz and many more family and friends. Duvon was a talented, bright, amazing young man, he was going to make it out. He could rap like you couldn’t believe, he always said “momma when I make it I’m buying you a big house.” We had so many plans together. Visitation will be Tuesday, December 11, 2018 from 4pm to 7pm and Wednesday, December 12 , 2018 from 10am to 11am at Newcomer NE Chapel 3047 E. Dublin Granville Rd. Funeral services will follow Wednesday at 11am at the Funeral Home. Add your memories to the guest book of Duvon Mathews. I will forever be missing you Duvon , still doesn’t seem real that this is happening. Just know I will be missing you until we meet again little brother fly high baby you are already missed so much ?? Thank you so much for being the best guy friend i could ask for.. YOU brought me food every single day because I would sit on facetime with you and be so mad you had good food the night before so you’d bring me some in the morning.. I miss getting kicked out of Mrs.Sternfields office with you and going to A and B Lunch!! You didn’t deserve any of this and your sweet memories will always remain in my heart! I love you duvon!!! Thank you for the endless facetime calls at 2 a.m even when you told me you were tired ! Fly high and watch over me bestfriend! I am so deeply sorry for your family’s loss. Losing a loved one in death, especially at such a young age, is one of the hardest things anyone ever has to go through. However, this pain and grief is not something our loving God ever wanted us to experience. He promises that soon all sickness, pain, suffering, and even death will be done away with forever (Revelation 21:3,4). I hope this promise brings your family great comfort during this difficult time. 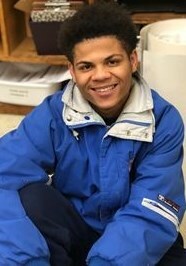 Duvon was a special, young man and he was easily one of my favorite students. He was incredibly goofy, but when others needed him, he was there for them and knew how to make them smile. He always found a joke to say when the situation called for it, and he would go out of his way to make people feel wanted. Many people know that Duvon wanted to be a rapper when he grew up, but he also wanted to become an architect. I will miss those conversations about all of the things he wanted to design and build when he grew up. I hope that he will be remembered for his kind words and desire to want better things for himself and others. Duvon will truly be missed.